This is your best option, since the train is fast, comfortable, inexpensive, and drops you off within walking distance of the Salzburg sights. Which is why there are no non-stop bus services that I know of. Trains leave Vienna for Salzburg from both the Hauptbahnhof and Westbahnhof stations, with three or four trains leaving each hour. Journey times vary, but can be as fast as 2 hours and 22 minutes. So an early train gets you to Salzburg for breakfast. Based on my experience, both ÖBB and Westbahn are excellent rail carriers. 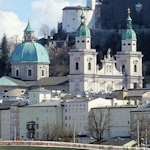 Salzburg is about a three hour drive from Vienna; the A1 motorway connects the two cities. Walk down from the station to the river, then along Elisabethkai toward the city centre. This takes you past Mirabell Palace and gardens. Then nip across the bridge to walk into the old town, up historic Getreidegasse and across to the cathedral. Then it’s a climb up to the Hohensalzburg fortress. All that is less than an hour’s walk at a good pace, so you’ve plenty of time to explore. To get a quick glimpse of everything without effort, take one of the city bus or boat tours. For example, there’s a city centre bus tour* that starts from Mirabell Palace, which is a 10+ minute walk from the station. It takes you around the historic centre before dropping you off at Mozart’s birthplace and museum. Then it’s back to Vienna in time for a late-night sausage (and nobody need know you left).